Valentine’s Day is has passed, but the some of the gifts that you were showered with on that special day are still there, looking at you every time you pass it. The question is, what do you do with all of that leftover candy? I have comprised a list of the top 5 uses for Valentine’s Day Candy. This list should give you a pretty good running start. Anyone want a chocolate caramel sundae, sounds sinfully delicious right? How about a Chocolate Crunch Ice Cream sprinkled with real Chocolate Crunch candy. Making cookies for the kids, throw a handful of chopped chocolates in the cookie dough for a chocolate chunk version! Making a cheesecake, add some chocolate strawberry candies to the top of your cheesecake, YUM! Enjoying a nice bowl of yogurt for breakfast? A scoop of chocolate candies won’t hurt anything. Besides, chocolate is healthy anyway, right! Baking a cake, or brainstorming the next cake design or cake flavor! Look no further than that box of Valentine’s Day candy for your inspiration! Chop candy and drop some into the cake batter – but be sure to coat with flour so that the candies won’t sink down to the bottom. Filling with buttercream, layer chopped candy over your buttercream for an added crunch. Looking for an extra something for your stuffed cupcakes, stuff with a piece of candy! Popcorn candy mixture or trail mixture for the kids. Pack it to bring as a school snack! I’m sure they’ll enjoy picking the candies out of the bag! Enjoy sipping coffee in the mornings? Add candy to your warm coffee for an instant mocha flavor. I’m sure you’ll enjoy tasting the different flavor variations that you’ve created. If it’s extraordinarily awesome, submit your idea to Starbucks! Last but certainly not least, GIVE. Give not to receive, but in giving you find the blessing is itself the joy of giving. Give unto others that may not have had someone to buy them gifts. There are so many that go forgotten as we move about our busy lives, sometimes just longing for someone to acknowledge them or smile their way. Any extra candy, chocolates, truffles, or bonbons would certainly be appreciated by the elderly in assisted living facilities, widowed neighbors or loved ones, or the men and women in homeless shelters. I’m sure they would love a little sweet treat. 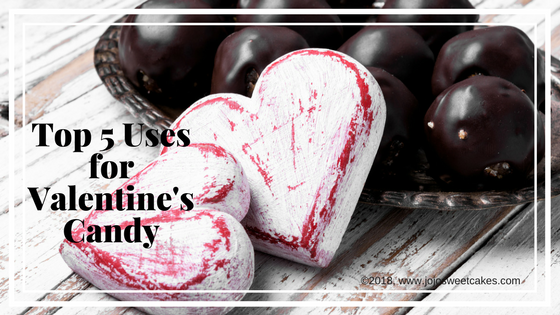 Thank you for reading, and please comment below some other uses for your Valentine’s Day Candy. I’d love to hear! One of the main benefits is scratch made cakes. If you have never tasted a scratch-made cake, it is truly divine. 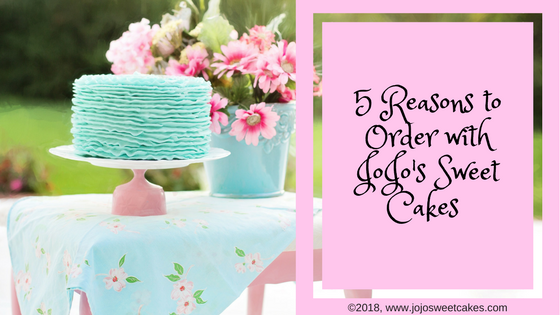 JoJo’s Sweet Cakes are never mass produced, and the ingredients that I use are always high quality so my cakes are always fresher and have a longer shelf life. You also have the option to choose from a wide variety of flavors. Customizing a cake is much deeper than adding a name to a pre-decorated cake. It is a cake, cookie set, or cupcakes all decorated to match a hobby or special flower or special decorations, etc. The options here are limitless! Custom made cakes are a little more expensive than grocery store cakes but they are certainly worth it. Just taste one… Custom made cakes take a lot of time and attention to detail to make it just right for you. Whereas, grocery store cakes are mass produced with artificial ingredients and hold no value to you or anyone else. At JoJo’s Sweet Cakes, we believe that cleanliness is a virtue. There is simply no room for compromise when it comes to hygiene. We practice and follow strict standards of hygiene and operate in a pet-free environment. Ordering a custom-made cake with JoJo’s Sweet Cakes means that I took time planning and crafting a work of art for your occasion. Next time you are tempted to buy a grocery store cake, remember the person for whom the cake is for. That person would appreciate a great tasting, custom cake, with so much value, from a clean kitchen that is made with love because those are the things that really matter.